The Finnish Final was held on February 1st at the Barona Areena in Espoo, hosted by Anne Lainto & Ile Uusivuori. Before the final there were 3 semi-finals - click here for details: FINNISH SEMI-FINALS 2014 The winner was chosen by televoting (50%) and an "expert" jury (50%). The results of the "expert" jury appear in the 1st column of results followed by the televoting top 3 & the overall top 3. 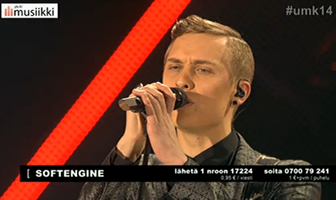 Softengine came equal 11th at the ESC.